Race replicas have been around for decades now. From Repsol Hondas to Pepsi Suzukis, they’ve largely been a marketing gimmick to boost sales. Of course they’re not all show and no go; some manufacturers have commissioned special editions to add a little race to the replica. From the mild Phil Read TT Formula One Honda CB750s to the wild Ducati Desmosedici RR, it allows weekend warriors to imitate their heroes. The problem is the Seeley built Honda was barely faster than a stocker and the Desmo is so nuts it’s best suited to the track and an absolute pig on the road. So could this be the best race replica ever built, finally striking the right balance? 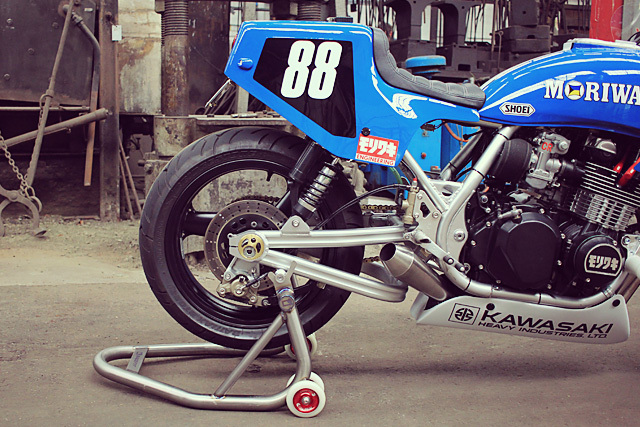 DNA Custom Cycles’ Moriwaki ‘91 Kawasaki Zephyr has the go, the show and will hammer down Gardner Straight while still be being a pleasure on the street. “I had always liked the endurance racer look so I went down that path with the full rebuild. Like an 80’s Z1 piloted by Wayne Gardner crossed with a Bol ‘dOr or Le Mans endurance racer. I wanted it to be roadworthy and legal, so this pushed me into a lot of research for parts,” says Bryan Kidd, the bike’s owner. 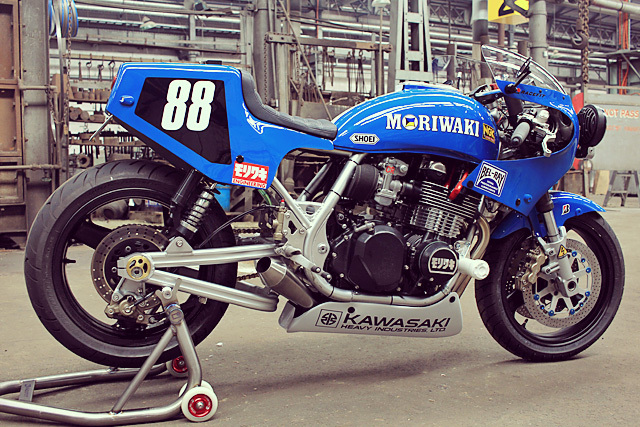 But first Bryan would need a base for the build and it was the 1991 Kawasaki Zephyr 750 he’d owned for five years. Having first bought it in full sheepskin seat cover and luggage rack spec for $500. It then underwent a transformation into rat cafe machine, but when a few things needed upgrading all hell broke loose. “The carbs were shot, the front brakes spongy, and the base gasket was weeping.” As good a time as any to build a full on custom don’t you think? And the ’90s Z has many advantages over its more prestigious older brother for such a build. Far cheaper purchase price, modern technological advantages and yet still with the retro flavour. But to overcome this hurdle Bryan stripped the bike and brought in a number of partners to work on individual areas of the bike. With the goal of having it ready for the annual run from Sydney to Phillip Island for the MotoGP. The ZXR1200 swingarm conversion was done by Harley at RB Racing. The old swingarm pivot was seized so it had to be cut out. But it was a straight swap with just the sprocket carrier to be machined down 5mm to align the chain. With the wheel and brake from the same model swapped in, the rear end gets racy proportions. The spongy conventional forks are swapped out for USD ZXR750 items. Rebuilt, chromed, anodised and powdercoated with Racetech gold valves from Shock treatment in Sydney. They look the business but not quite as good as the triple trees holding them in place. Darren at DNA Customs did a lot of work on the build and the CNC’d upper triple clamp features a hidden cam locking mechanism. With the Zephyr rolling it was off to Flywheels in Marrickville for Ron to pull the engine and do the rebuild. The engine was stripped, sandblasted, powder coated and painted, with the fins being linished. A Wiseco 810 kit was fitted with the pistons Teflon coated and dropped in with all new bearings and seals. New compression should be about 10.5:1, enough to run pump gas comfortably. The cams were ground with a hot street profile maximising torque down low and upping power up top. While the head was ported, valves reground and seated. 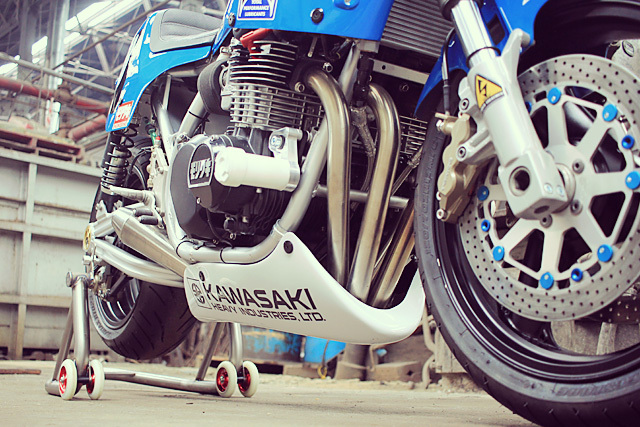 Fuelling the fire is a set of CR29 Keihin carbs that are a favourite of many Kwaka racers. Venting the gases and making a beautiful sound is the Stainless steel exhaust that Darren took care of exiting out a reverse cone muffler. Helping the air-cooled lump stay intact is a Racimex Oil cooler from Germany with Racetech fittings. 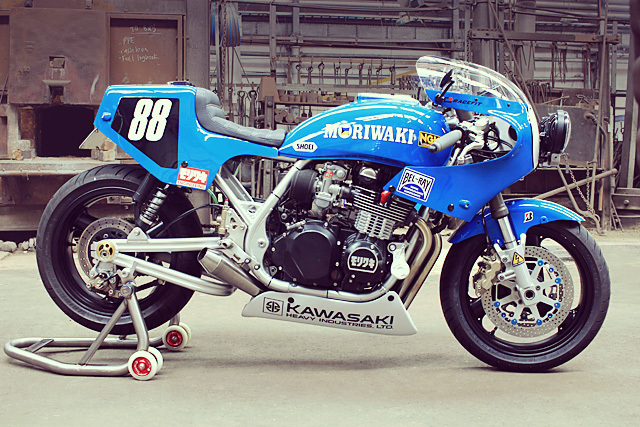 While a Moriwaki points cover from Japan gives some authentic flavour. With the result being a screaming 9,500 rpm with about 90hp, a final tune still to come. With a rip snorting roller and high horsepower lump to put into the frame it was time to get the look right. It was back to Darren at DNA Customs to make it all work. 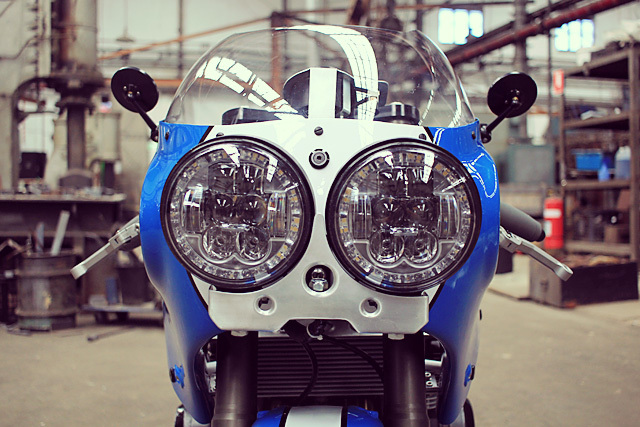 He started by modifying the subframe to take the new tail and lights, then started on the front end fairing stay and clock mounts. With no engine in the frame at the time it was no easy task, but he’s done a remarkable job. The custom CNC’d bracket for the headlights just one example of his craftsmanship. A new tank was needed as the original was leaking like a sieve. But now with a race style filler brilliantly moulded in, it’s like no Zephyr tank ever before. The bodywork itself is a clever combination of parts to get exactly the right effect. 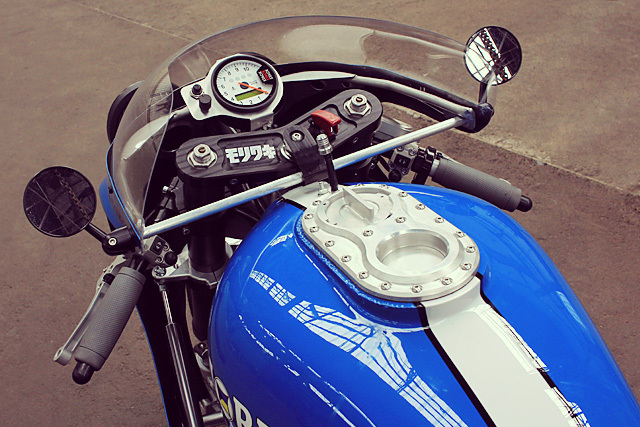 A Moriwaki 2 tail section, XR69 front fairing and universal belly pan and tail lights all come from Airtech in the USA. The tail-piece is made just as cool as the tank with the Shorai Lithium battery now exposed, capable of Enduro style quick changes. Peter at Cutting Edge Paint had the job of spraying it all up and along with Bryan they shared a unique journey to the colour combo. “He sent me 5 colour samples and told me to pick two, he would pick two and where we crossed over that would be the colour. 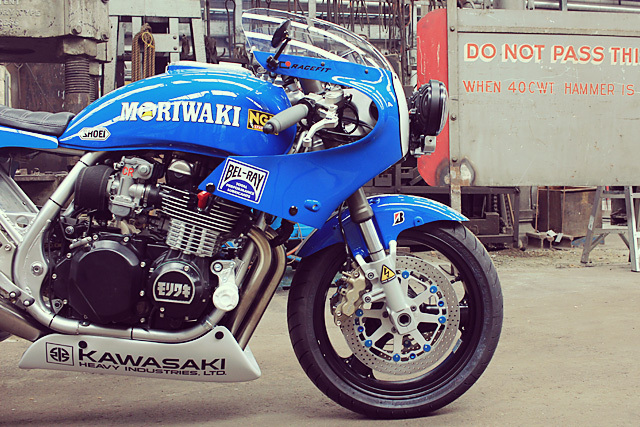 He nailed it!” Unconventional to say the least, but boy does it work and with the genuine Moriwaki decals looks incredible. The accessories are just as impressive, Beet rearsets are complimented by Woodcraft clip-ons that wear Biltwell grips. ISR levers, switchblocks and front discs come from Sweden, Watsen design flush mount indicators made in Canada. And with the beautiful Stack ST700 dash from the UK the build becomes the world’s best work fitted to one machine. Frame sliders are good insurance while the LSL bar end mirrors and JW speaker headlights keep the law man happy. 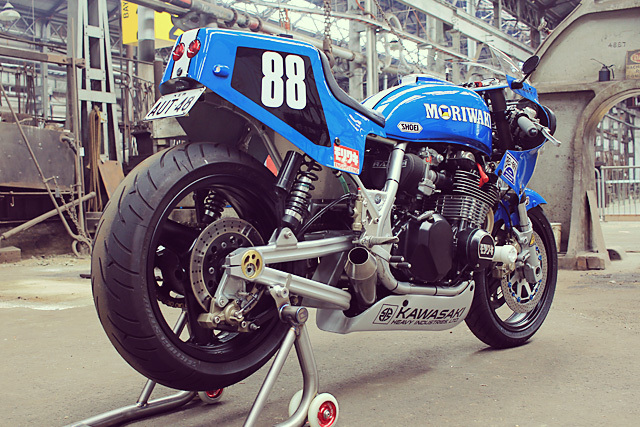 Finally it was time for the Moriwaki Kawasaki to makes its voyage from the Harbour city to the home of Australian GP racing, Phillip Island. As a round trip it’s 2500km and with only one small electrical issue, sorted by Darren over the phone, she rode like a dream. “It has very usable power, great stance and a lovely tone from the exhaust. It is not the most comfortable whip, but handles the tight technical stuff pretty well.” To add a little more spice to a delicious dish there are a set of custom Racetech G3S shocks on the way. 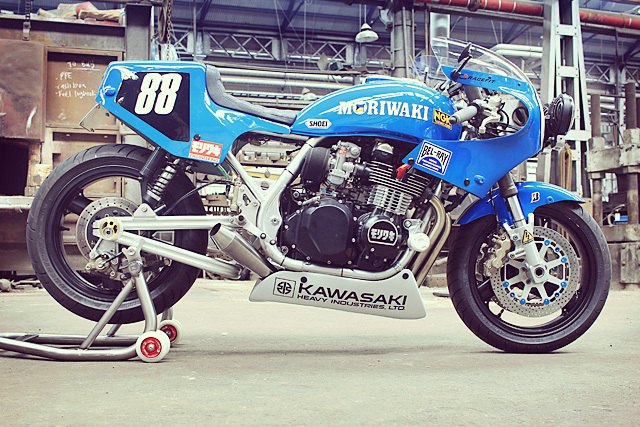 But you’d have to think Mr Moriwaki, who married into the Yoshimura clan, would love nothing more than this incredible race replica. Built by a talent filled collective, ridden to the races and loved by all; it’s the perfect bike to wear his name.